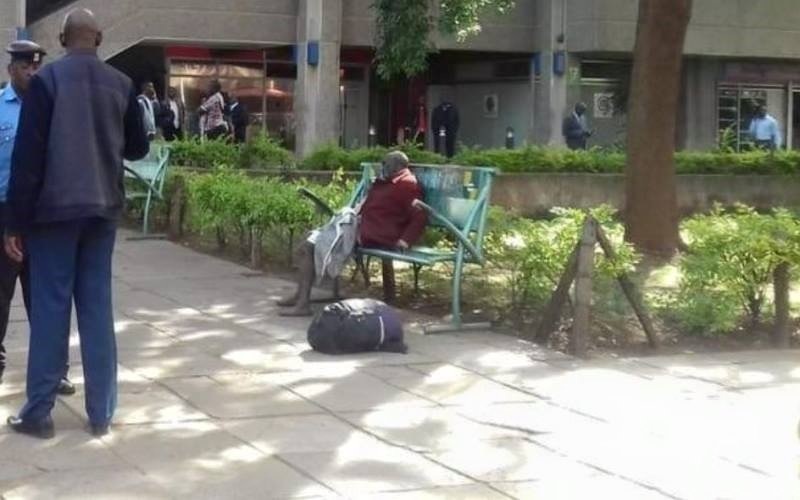 Tuesday, January 29, 2019 - There was scare and drama in Nairobi’s Central Business District on Tuesday morning after a body of an elderly man was found lying motionless on a bench near Kenya Cinema. According to security officers who guard the nearby premises, the man arrived at the scene around midnight carrying a bag and sat on the bench. At around 5AM, they discovered the man was half-naked and the trouser and shoes he was wearing were missing. They touched him and noticed he was motionless. Police were called to the scene and confirmed the man was dead. There was a little scare because of the an unattended bag that was lying next to him and police couldn't take chances following recent cases of terror attacks. When police opened it, they found some medicine. At first, people thought the man had been drugged and robbed off his items but it’s highly likely that he succumbed to illness. His body was taken to hospital for postmortem as investigation continue.